Solar panels are finicky devices—they have to be specially mounted, angled, and presented with the precisely correct environmental conditions to function at capacity. The complexities make it hard for the technology to gain mainstream appeal. 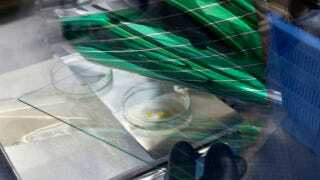 A German startup could change all that with flexible solar cells built using OLED production techniques. Developed by Heliatek in Germany, the panels are composed of organic modules embedded on a polyester sheet. They're made in a way similar to the process by which OLED displays are printed. The technique results in a panel that's more flexible, lightweight, and versatile than a conventional, rigid panel. The panels use two stacked layers of solar cells arranged in a patented tandem cell construction, which can absorb a broad spectrum without relying on thick wafers of silicon. And, under less-than-ideal conditions, the panels can generate as much electricity conventional solar panels. Heliatek's product can be deposited on a single continuous roll of film, which eliminates the need for clean rooms. This, and the fact that the panels can be cut to size, reduces production costs.